Every now and again our plans are thrown off course and we have to adapt to the new circumstances. In April I suffered one such ‘bump in the road’, a slipped disc and I ended up in hospital. At the same time I was given the news that I need a major operation for an unrelated issue this summer so I have had to cancel all my demonstrations and events for the foreseeable future. I am sorry if any of these cancellations have affected you. I may not be accompanying David at his events either and will miss seeing old and new friends. but I hope to be back on course again by the autumn. 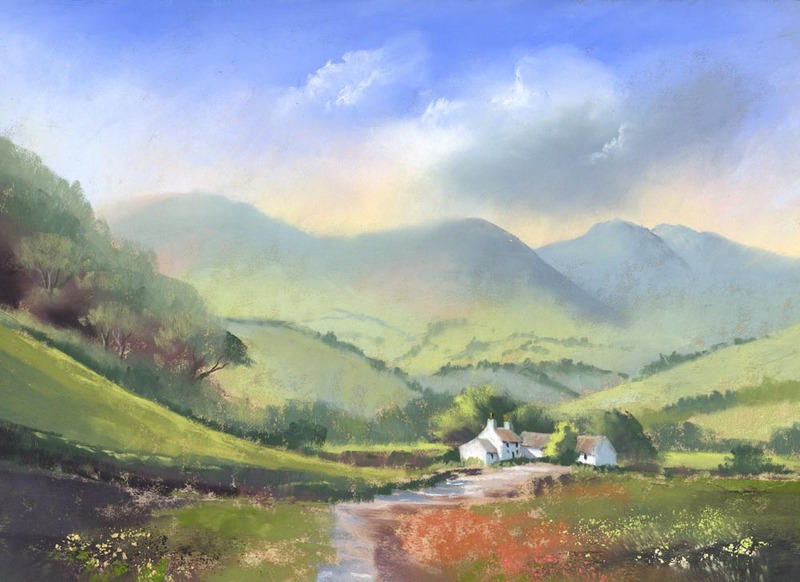 The pastel painting below was the last demonstration I did this year, for Llantarnam Grange Art Group in Cwmbran in March. The theme was ‘creating atmosphere’ and pastel is the ideal medium for this purpose. Softening the edges of the distant features in order to create a sense of atmosphere is relatively simple with pastel. To create this effect of clouds over the hilltops, just gently stroke some of the sky colour down over the distant hills. This pushes them into the distance. The same method was used lower down in the distant hills, softening the green colour of the lower slopes into the blue/grey. This softness is emphasized by making the edges of the focal point sharper and the tones darker. All these techniques help to create the illusion of recession in a painting. 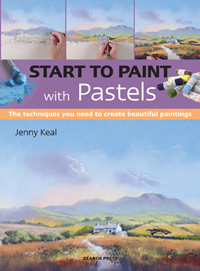 You can see this technique and many others, demonstrated in live action on my DVD, Painting with Pastels, available in our online shop. I hope you find time to get out in the countryside this summer to paint and sketch and store up subjects for the coming winter months. Nature has a way of invigorating and at the same time restoring tranquility in our busy lives.